These are two characteristics Kim Snyder has continuously embodied throughout his career in the aggregate industry. 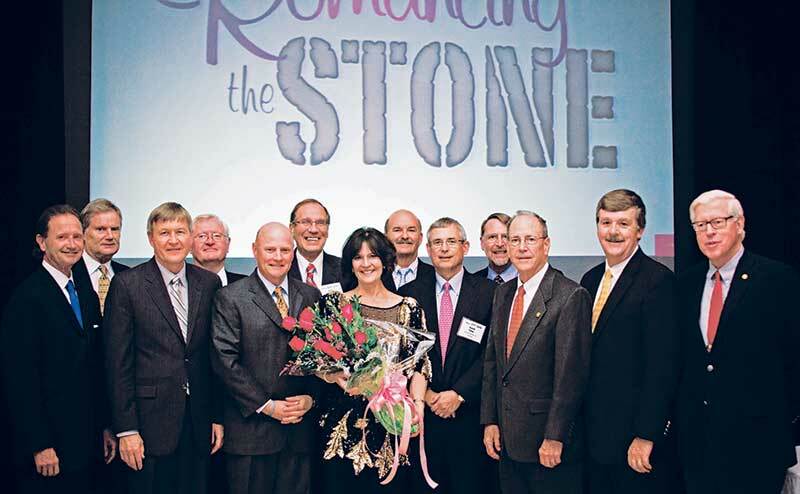 Snyder, the former president of Eastern Industries who today serves on the board of directors at three companies, was the National Stone Association’s (NSA) chairman in 2000 when the association was deciding whether to merge with the National Aggregates Association (NAA). Although merging the two organizations seemed difficult, Snyder maintained his vision of the two becoming one strong, singular voice for the aggregate industry. Snyder has aimed to project his vision among employees and colleagues wherever he’s worked. He especially did this at Eastern Industries. “He always did what a leader’s supposed to do,” says Paul Mellott Jr., chairman of Mellott Company and a close friend to Snyder. “He had a vision for what the company could be, he opened up that vision to his people and his employees took the company and ran with it. 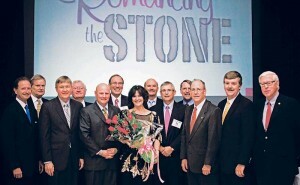 Kim Snyder, second from right, during an NSSGA board of directors meeting in 2012. Snyder grew up in a blue-collar household in upstate New York, and he became the first in his family to go to college upon graduating high school. His high school guidance counselor noticed his aptitude for math and science and encouraged him to study engineering in college. After receiving a degree in engineering, Snyder began work in the aggregate industry as an engineer for companies such as Dravo Corp. and Koppers Co. He went back to school to receive an MBA in 1982 before transitioning to the business side of the industry in 1991, when Genstar appointed him as vice president of aggregate operations. Snyder dubs Grove as one of his first mentors, as he helped him navigate the business side of the industry. Grove’s prodding prompted Snyder to get involved in the industry on a national level in NSA and the National Ready Mixed Concrete Association. Grove also encouraged him to develop relationships with elected officials at both the state and national levels. Outside of association involvement, Grove entrusted Snyder to help coordinate business for Genstar with Redland Co., the company’s owner in the United Kingdom. Although there were a few conflicts between the two groups, Snyder peacefully handled relations between the two during his time at Genstar. Snyder left Genstar in 1995 to become president of Eastern Industries, but he always kept Grove’s advice about industry involvement and lobbying in mind. He remained heavily involved in NSA, moving up the ladder of association leadership. Snyder’s mediating skills from his time at Genstar came in handy as he moved his way up the chairs at NSA in the late 1990s, as that was when the association was negotiating a merger with NAA. Snyder notes that NSA tended to be more business-oriented while NAA placed a bigger emphasis on the social aspects of the association. Despite the differences between the two groups, Snyder continuously watched and listened in on the discussions leading up to the merger to determine a formula to make the alliance work. He also maintained a good relationship with Mike Hayes, chairman of NAA in 2000, in order to move things forward. The two associations officially merged June 19, 2000, into what is today known as the National Stone, Sand & Gravel Association (NSSGA). Snyder described that day as “historic” for the industry in an August 2000 article in Pit & Quarry. After the merger, Snyder continued to contribute to NSSGA in different capacities. 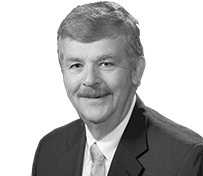 Most notably, he helped to lead discussions on co-hosting AGG1 Aggregates Academy & Expo with the World of Asphalt, as he was also involved in chair positions with the National Asphalt Pavement Association. By 2010, the two groups officially co-hosted their events. Since his time at Genstar, Snyder also remained committed to connecting with politicians as Grove taught him. Snyder became a proponent of grassroots efforts, particularly during his time at Eastern Industries. He hosted a number of meet-and-greets with legislators at the company’s locations and involved all of his employees in the events. “If I get employees involved in a team of six to eight of them talking to legislators, the legislators’ eyes might then be opened to our concerns,” Snyder says. Snyder has also befriended some legislators, like Sen. Pat Toomey of Pennsylvania. To this day, he remains a good friend to Toomey, keeping in contact with him and his family. Many in the industry also know Snyder for his work with ROCKPAC, the association’s political action committee. For the past decade, Snyder has teamed with Mellott to go onstage during the ROCKPAC fundraising event.